At first, Merry Christmas to all of you. This is my first post after 10 days on the occasion of Charismas because i was busy in my exam and so I could not post any article. But now i am completely free and ready to enjoy Christmas with the lovely readers of HowToUncle. Generally, most of the people like to use Gmail for their work but instead of Gmail many other email services are also much popular and Outlook.com is one of them. Many people prefer to use outlook for official use or in the cases where the use of Microsoft account are needed. It may be, you also wish to use Outlook.com but you are hesitating because you think that your all Important Emails, Contacts are available on Gmail. But you should know that you can import all your Emails and Contacts from gmail to Outlook just by using few simple steps. Read: Do you know about the Safety of Your Email Attachments? Important information: If you have used or familiar with the process of TrueSwitch Page to transfer all the Emails and contacts from Gmail to the new Outlook account then please now you shouldn't be dependent on that because recently outlook has closed that service. It means no one can use that method. After closing the old method, Outlook.com introduced a new and very simple import tool which helps you to move all your Emails and Contacts from Gmail to Outlook. With this new import method you haven’t to do any manual action, all importing process will be automatically. I have already used this useful method and felt very easy, that’s why I decided to share this useful tips and tricks with all of you. Follow the below mentioned instructions and import your all emails, contacts from Gmail to outlook.com. 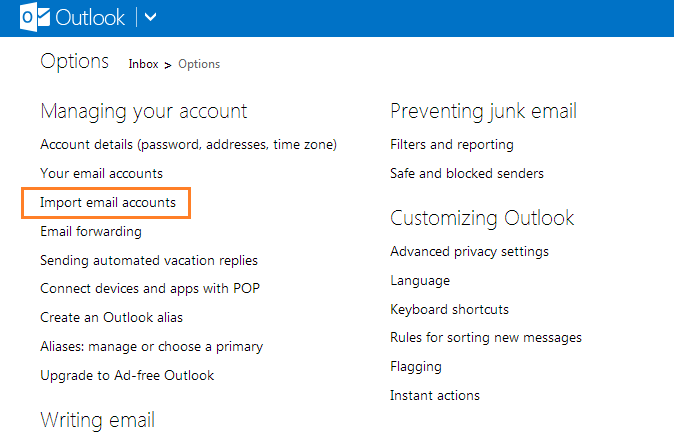 Step (1): Firstly, Login to your Outlook account using your username and password. Step (2): After login, click on the “Gear” icon from the Top right corner of the inbox page and select “More mail settings” option from the drop-down menu. Step (3): Now from the Outlook mail settings page, make a click on the option of “Import email accounts” under the “Managing your account” section as shown in below screenshot. Step (4): On the Import email page, you will see two options such as: “Google Gmail and contacts” and “Email apps on your PC Email and contacts”. Here you have to select the first option that is “Google Gmail and contacts”. Step (5): After that you will be able to see the option as shown below. You must know one thing here that the importer tool will import all your Gmail emails into existing folders such as Inbox, Sent and Draft automatically. But if you wish to create new folder or sub folder for your emails then you can create it by choosing the options link. When you’re ok with it then click on Start button. Step (6): On the next page, you will have to enter your Gmail account’s username and password from where you want to import your all emails and contacts. Step (7): Now an authorization page will appear, here you have to click on accept button. Step (8): After clicking on accept button the importing process will start immediately on your account. It will take only few minutes to complete depending on the amount of emails and contacts that are being imported from your Gmail account. 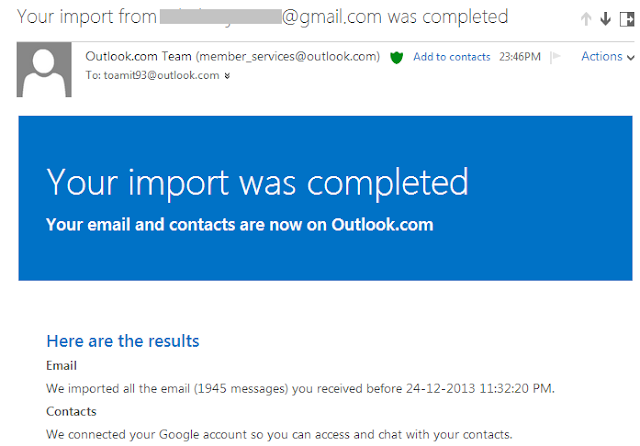 Step (9): when the importing process will completed, you’ll receive an e-mail as shown below. Congratulation! Your all emails and contacts are successfully imported on Outlook.com. 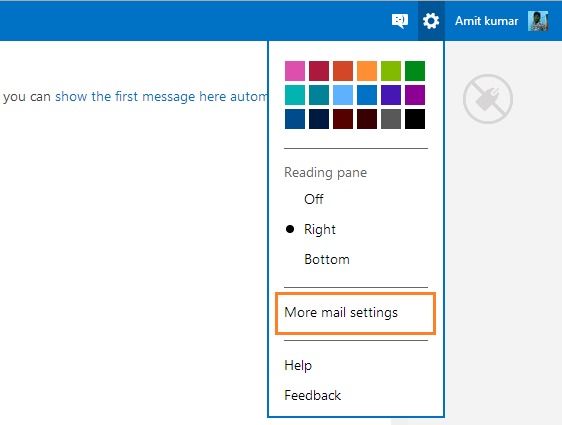 Now you can freely use your all emails or contacts from outlook. Give a try and share your experience with us through comments. To get more useful tips and tricks, latest updates related to Gmail check out our Gmail Tips section. Connect with us on Google+ | Facebook | Twitter.